Secretary of Health and Human Services Tom Price, shown here at a discussion about opioids on Thursday, drew fire for his use of private jets. President Trump had said multiple times this week that he was "not happy" about the optics of Price's travel. Friday afternoon, federal agencies were told that "all travel on Government-owned, rented, leased, or chartered aircraft, except space-­available travel and travel to meet mission requirements ... shall require prior approval from the White House Chief of Staff." 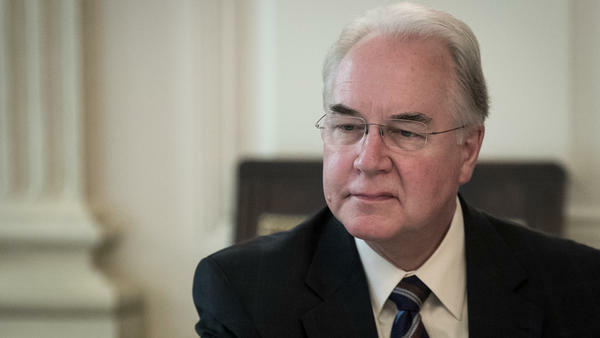 In his resignation letter, Price said, "I regret that the recent events have created a distraction" from his work at HHS. The White House said that Trump intends to designate Don Wright, currently deputy assistant director for health and director of the Office of Disease Prevention and Health Promotion at HHS, as acting secretary. The work-related travel, which was first reported Sept. 19 by Politico, cost taxpayers nearly $1 million, or about $400,000 for private charters and $500,000 in military airplane costs. Most of the trips were between cities where inexpensive commercial flights were also available. The revelations had sparked a flurry of criticism from government ethics watchdogs. Sen. Patty Murray, the ranking Democrat on the Health, Education, Labor and Pensions Committee, which oversees some parts of Price's agency, wrote an angry letter to the secretary on Thursday about his travel habits. "The decision is particularly shocking as you serve in an administration that routinely calls for draconian spending cuts and a reduction in government waste, and you yourself have repeatedly advocated for fiscal restraint," Murray wrote. HHS Inspector General Daniel Levinson launched an investigation of Price's travel spending on Sept. 22, and the House Committee on Oversight and Government Reform has requested information on the flights. Price tried to contain the damage on Thursday by promising to pay back the costs for his own seats on those flights chartered on his behalf, or about $52,000. But that offer didn't approach the total costs of the trips, which included his staff and sometimes his wife. "I regret the concerns this has raised regarding the use of taxpayer dollars," he said in a statement. But that wasn't enough. On Friday, rumors mounted that Price's tenure was in peril, fueled by Trump's own afternoon statement that an announcement would be coming soon. Price, a former Republican congressman from Georgia, was confirmed in February to lead HHS, the trillion-dollar agency that runs Medicaid, Medicare and the National Institutes of Health. It also administers the federal health care exchange created by the Affordable Care Act. He had a reputation as a budget hawk who would fight government waste and rein in spending. A former orthopedic surgeon, Price was a fierce opponent of the ACA, also known as Obamacare. While serving as head of HHS, he cut the agency's spending for outreach and advertising in support of the insurance exchanges created by the law and issued news releases and created videos critical of the law's effects on the individual insurance markets. Price was often criticized for what appeared to be efforts to undermine a law he was charged with implementing. The travel scandal wasn't Price's first brush with ethics problems. During his confirmation hearing he faced tough questioning from Democrats over a series of stock trades in which he made money selling shares in companies over which his committees or the House held sway. Price, 62, who had been chairman of the powerful House Budget Committee and a member of the tax-writing Ways and Means Committee, says he followed all congressional ethics rules, but his well-timed trades made it appear that he could have used his position to influence the price of stocks he owned or that he had received special treatment from companies in which he invested. In one case he got access to special discounted shares of an Australia-based biotech company called Innate Immunotherapeutics. The price of the shares then quadrupled. In another case, Price bought shares in Zimmer Biomet, an Indiana-based manufacturer of replacement knees and hips, and then introduced a bill that would have affected the price of such joint replacement surgery. Seema Verma, a protege of Vice President Pence's, has been mentioned as a possible successor to Price, The Associated Press reports. Verma leads the Centers for Medicare & Medicaid Services, which runs health insurance programs that cover more than 130 million Americans. Scott Gottlieb, the commissioner of the Food and Drug Administration, has also been mentioned frequently. He is a physician with health policy expertise, including prior stints as the FDA's deputy commissioner for medical and scientific affairs and before that as a senior adviser to the FDA commissioner.